Exploding Kittens is a digital conversion of a casual play party card designed by Elan Lee and based on characters from the popular comics website The Oatmeal. The original physical card game was an amazing success raising over eight million dollars in its Kickstarter campaign, becoming the highest funded card game and one of the all-time most funded projects to date on the crowdfunding site. 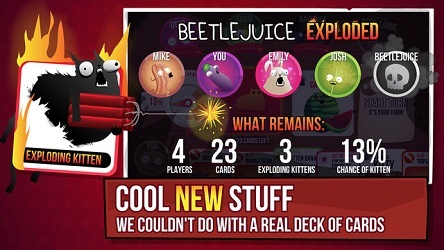 Exploding Kittens is a casual quick play local multiplayer party game designed to be played by two to five people in the same room on multiple devices. The game play is very simple and can be explained completely in the short video linked below. Players take turns drawing cards from a shared deck until one of the players draws one of the titular exploding kittens. Unless one of the previous cards that player has drawn can mitigate or "diffuse" the exploding kitten, that player is eliminated. Play continues that way until only one player remains and is the winner. The app version of the game features new cards exclusive to the digital version and art illustrated by people from The Oatmeal. While the current version is designed for local multiplayer only, the developers have indicated that they are currently working on adding asynchronous multiplayer to the app. As a "launch special" players who buy the game early receive the three currently available in-app purchases entitled "The Party Expansion Pack", "The Animals Avatar Pack" and "The Food Avatar Pack" for free. 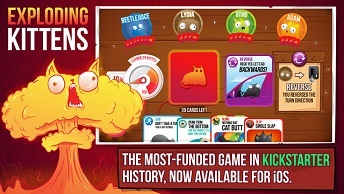 There is no word yet as to whether the developers intend on porting the app version of Exploding Kittens to other platforms but due to the popularity of The Oatmeal, the physical card game and the success of the Kickstarter versions for other platforms seem likely.